1947: Born at Dongen , the Netherlands. 1965: Secondary school at Dongen. 1969: Training school for Teachers in Manual Labour, Eindhoven, The Netherlands. 1972- 1979: Workshops graphic art with Anne Huitema Overcinge, Havelte, The Netherlands. 1979- 1992: Workshops graphic art with Selma van Vemde, Arnhem. 1990 -1992: Supervision of dream therapy with prof. Vossen, Middelaar (image communication). 1991: Nominated for the A.C.Art Reward of Arnhem. 1993: Membership of the Amsterdam Graphic Art Studio. 1996: Workshop Helio engraving with Peter Singovic. 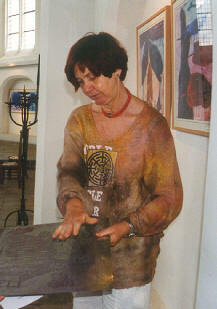 1997-2000: Member of the artists group "Het Venster". 1998: Member of the G.B.K. artist group. 2002: Masterclas: Edinghburger printers by Alphons Bytautas. 2002: Member of the artists group "Arts-place"
2004: 2nd price Castle Garden Hemmen with etching Lined-up Hosta's, 1999. 2005: Member of the V.O.G. (Vereniging voor Oorspronkelijk Grafisch Werk). 2005: Artist in Residence in Beijing at the Red Gate Gallery,Bei Gao District. 1993: Art gallery Eglantier, Amsterdam. 1997: Teylers Museum Haarlem: presentation of graphic art map 1998 at Eric de Jong's lecture "History of 17th century gardens"
1999: Hemmen Castle, Hemmen, The Netherlands. 2000: Persingen Church, The Netherlands. 2000: Kunstschouw, Westenschouwen, The Netherlands. 2000: Botanical Gardens of Amsterdam University. 2000: Gallery "De Sleedoorn ", Zetten, The Netherlands. 2001: South-Holland Graphic Art Show. 2003: Gallery Unita, Nijmegen, The Netherlands. 2004: International Art Event, Antwerp, Belgium. 2004: International Art Event, Dortmund, Germany. 2004: University of Gent (Belgium). 2004: Gallery Kdijk, Gendt, The Netherlands. 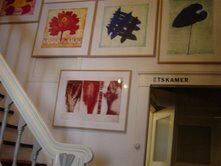 2005: Gallery Inkt, The Hague. 2005: Bovag, Utrecht, The Netherlands. 2005: Artist in residence in Beiing. 2005: Museo Monastero Delle Lucrezie, Todi, Italy. 2006: Galerie Het Huys met de Luyken, Zutphen, The Netherlands. 2006: International Graphic Arts Show, Groningen, The Netherlands. 2006: Gallery Zero, Barcelona, Spain. 2006: World Art Print Annual, Gallery Lessedra, Sophia, Bulgaria. 2007: Doornenburg Castle, The Netherlands. 2007: Graphic Art from Portugal, The Netherlands and Belgium, Museum Nagele. 2007: Jubilee Exhibit "Rariorum Plantarum", Persingen, The Netherlands. 2003: Graphic Map for the Barenbrug grass seed company. 2004: Graphics for the Barenbrug company on the occasion of receiving the designation 'Royal'. 2004: Graphics on the occasion of a scientific congress organised by Royal Barenbrug. 2004: Calendarium for Gelsenkirchen, Germany. 2005: Jubilee Etching for the Woningstichting Valburg.